For the first time in their three decades of existence, the disco band The Village People have inducted an openly Episcopal man, igniting a controversy that threatens to tear the fabled group asunder. Holding a press conference in New York City today, The Construction Worker, a prominent member of The Village People since its inception in the 1970's, urged "tolerance and understanding" for its latest member, The Episcopal Guy, who joined the group over the weekend. "From the start, The Village People have been all about inclusiveness," The Construction Worker said. "And introducing The Episcopal Guy as our latest member is part of that tradition." While The Indian Chief and The Fireman were reportedly in agreement with The Construction Worker about including The Episcopal Guy in the band, The Policeman, The Cowboy, and the Leather-clad Guy were reportedly opposed,creating speculation that The Village People might split up into two smaller, somewhat less influential disco bands. The Evangelist Mark is believed by the early church fathers Papias (130 A.D.) and Irenaeus (185 A.D.) to be John Mark, the companion of Paul and Barnabus (Acts 12:25, 15:36-40). This means that, though Mark was not one of the Twelve Apostles, he was one of the disciples. It appears that John Mark went with Paul and Barnabus on their first missionary mission (Acts 13:5), but left them at Perga and returned to Jerusalem. The book of Acts mentions a Mark, or John Mark, a kinsman of Barnabas (Col 4:10). The house of his mother Mary was a meeting place for Christians in Jerusalem (Acts 12:12). The Apostle Peter had a disciple that he considered "my son Mark" (1 Peter 5:13). Papias, tells us that Mark was the "interpreter" of Peter, and that he wrote down ("but not in order") the Gospel using stories that he had heard Peter tell in his preaching about the life and teachings of Jesus. Mark seems to have been the first person to attempt to construct in writing a sketch of the whole ministry of Jesus, although he must have worked on the basis of an oral teaching as well as Peter’s preaching (see Acts 10:37-42). In the Gospel of Mark, at the time of the arrest of Jesus (14:51f), there is a young man who followed the arresting party, wearing only a linen cloth wrapped around his body. When the the arresting party tried to arrest him also, he left the cloth in their hands and ran away naked. Some feel this young man was Mark himself, since the story wouldn't seem to be very important if he were not. Tradition has it that after the death of Peter, Mark left Rome and went to live and preach in Alexandria, Egypt. The Pagans of the city got so angry at his efforts to win them to Christ, that they killed him, probably in 68 AD, and dragged his body throguh the streets, then tried to burn what was left. The Christians of Alexandria removed his unburned body from the ashes, cleaned it, and buried him in the Church they had built. 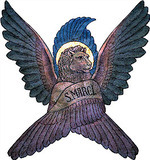 Mark's symbol in art is a Winged Lion. In the book of Revelation, John sees about the throne of God four winged creatures: a lion, an ox, a man, and an eagle. (Compare with the Cherubs in Ezek 1 and 10.) Tradition says that these creatures (or Cherubs) represent the four Gospels. Many feel that Mark is the Lion because his Gospel begins with John the Baptist crying out in the desert (a lion roars in the desert). Shed upon Your Church, O Lord, the brightness of Your light; that we, being illumined by the teaching of your Evangelist Mark, may so walk in the light of Your truth, that at length we may attain to the fullness of eternal life, through Jesus Christ our Lord, Who lives and reigns with You and the Holy Spirit, one God, for ever and ever. Amen. In the Cur Deus Homo?, Anselm puts forward the "satisfaction theory" of the Atonement. Man's offence of rebellion against God is one that demands a payment or satisfaction. Fallen man is incapable of making adequate satisfaction, and so God took human nature upon Him, in order that a perfect man might make perfect satisfaction and so restore the human race. The success of his work may be gauged by the fact that many Christians today not only accept his way of explaining the Atonement, but are simply unaware that there is any other way to understand Atonement. Finally - boy this Lent has been a difficult one for me. I was unable to complete my Lenten disciplines due to my brother's illness, but that was an even greater time of darkness than any Lent since my wife went though the same thing. Now that the darkness is past, my mind has turned to Resurrection, this Easter week. This past Easter Sunday morning as the beams of the rising Sun streamed through the clouds of incense over the beautifully flowered Altar during Mass, I was struck by the glorious sight, and realized this is but a shadow of the Glory that my own brother now beholds. So often we hear these words but do we see the sights? How did people seeing the miracle of the Resurrection for the first time react? They were women. Women steeped in Jewish culture and meaning, they KNEW the emblems of their faith. What did they see when they arrived at the tomb? Archbishop Williams has written an essay called "Between the Cherubim: The Empty Tomb and the Empty Throne," and has suggested that imagery of the Ark of the Covenant might help us Christians understand early Jewish thought when confronted with the emptiness of Jesus' Tomb. This is unique in the ancient world. The Ark was considered to be the throne, or the footstool containing of the tablets of the law, of an always invisible God. This God was the only God Who must not be represented, Who cannot be possessed or contained, Who is where there appears to be nothing. In other words, the most sacred space where God was in the midst of the Hebrew people was empty. If you went to Jerusalem to visit God, what you came to visit wasn’t a golden idol, it was empty space--the holy absence and holy silence of the empty space between the cherubim. Because there was no gilded statue the Israelites were able to connect with the living presence of God in their lives. 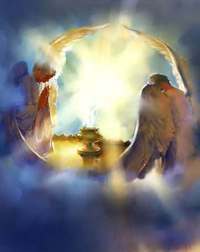 There, as told by Luke and John, when the Jewish women looked in, there are two angels, and John further states in 20:12 "and she saw two angels in white, sitting where the body of Jesus had been lying, one at the head and the other at the feet". Jesus has Risen, He is Lord and Christ! 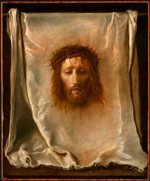 Holy Saturday is often a day overlooked in Holy Week as we busily get ready for Easter, but I thought I would share some thoughts on the subject. The Saturday after Good Friday, is the day on which we recall that the crucified Christ descended to the dead while His body lay in the tomb of Joseph of Arimathea. It is a somber day a day of Sabbath rest. There is no Eucharist - Christ has been taken from us, think of that! The tabernacle is empty, and all over the world, the ancient Churches join us in this unthinkable void. Through our meditations and the prayers of the Church, we can unite with His little band of followers and connect with them in their shock, loss, and despair. Holy Saturday is traditionally a day of quiet meditation as we contemplate the darkness of a world without a future and without hope apart from God and His grace. Also, it can be a time to remember family and the faithful who have died as we await the Resurrection, or to honor the martyrs who have given their lives for the cause of Christ in this world. This year is especially hard as I remember my younger brother, now laying in his grave, awaitng ressurrection along with countless others. Some also fast on Saturday as the climax of the season of Lent. An ancient tradition dating to the first centuries of the church calls for no food of any kind to be eaten on Holy Saturday, or for 40 hours before sunrise on Sunday. Fasting and other preparations end at sunset or with the Easter Vigil, which begins the celebration of Easter. However it is observed, Holy Saturday has traditionally been a time of reflection and waiting, the time of weeping that lasts for the night while awaiting the joy that comes in the morning (Psalm 30:5). 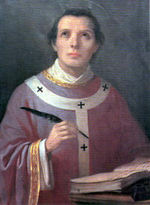 Fidelium animae † per misericordiam Dei requiescant in pace. Come with us, walk with Him, this Week that changed our World. If I truly believe what I say I believe, then now my brother beholds the Face of God. He knows as God knows, and what is hidden by a dark glass to me, shines brightly to him. I simply can not understand why God took Mike from his family, but one thing I do know and trust....in the Presence; Mike knows & rejoices. Wednesday April 5 at 8:00 PM, my brother Mike left this life for a greater one. His wife was right with him, holding his hand on one side, I and his sister and other brother were on the other side. This has been a long, hard fought battle and his dying process reflected that. His hospice nurse was such an God sent Angel of mercy to Mike and our family. I can't imagine what on earth we would have done without her. We are simply heartbroken, yet cling to God's promise of new life beyond. Please pray for his wife, daughter and the rest of his family.